It’s been some years since I’ve been able to communicate through radio outlets. This on account of a series of transfers between various states’ prison systems—from Virginia to Oregon, then Texas to Florida and back to Virginia—as reprisals for my political work and publicizing the inhumane conditions and abuses that pervade U.S. prisons in general and specific to each prison system I’ve been confined to. In each state I’ve been rewarded with solitary confinement and increasing extremes in my living conditions. These responses to my efforts prove the importance and power of media outlets that enable prisoners’ words to reach the public, giving those on the outside a look inside of the lived reality of the world’s largest disposal site for marginalized people and organized system of modern slavery. And let there be no doubt about it. 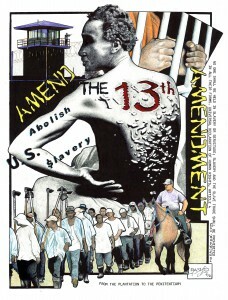 Slavery is alive and well in Amerika. In fact it was reformed at the end of the Civil War and preserved by the 13th Amendment which gave the state the power to impose slavery on those convicted of crimes. And in many cases, its conditions today are as brutal and dehumanizing as anything during the antebellum era. I’ve witnessed and endured some of its cruelest extremes in places like Florida where prisons are literally run by the Klan. This because in general the culture of many U.S. prisons is such that they provide a haven for groups like the KKK and neo-Nazis within their administrations and among their rank and file staff. It’s a culture where the fear and deference of prisoners toward their captors (conditioned through outright violent terror) replicates almost exactly that of Blacks towards whites under the chattel slavery and Jim Crow systems of the Old South. The absolute power of prison officials is no less extreme. And they exercise that power just as arbitrarily. But oppression breeds resistance and a movement is underway where prisoners across the U.S. are staging a range of protests in opposition to slave labor and inhumane treatment in U.S. prisons. This movement needs not just public awareness but public support, not just allies, but comrades on the outside. Please give your active support to this struggle since it seeks not only the recognition and respect of the humanity of U.S. prisoners, but it also seeks conditions that will lead to their healing and betterment, and not to creating people—as the present system does—who often leave these places in a worse state than when they came in. Slavery and abuse do not teach people how to be free!